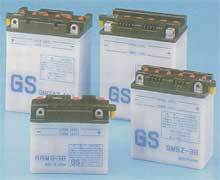 Most types of lead/acid batteries are held in stock (dry charged 6v and 12v). Others can be obtained from manufacturers GS, Yuasa and Exide. All YTX and CTX gel sealed batteries in stock. All personal callers can collect batteries "wet" at no extra charge, although most car accessory shops and garages will fill your battery for a small charge. For the correct application for your bike please give us a call on 01425 472100.